The popularity of mobile phones in South Africa is helping to tackle HIV and Aids in the nation. Project Masiluleke will send one million free text messages a day to push people to be tested and treated. Approximately 350,000 people die of Aids-related diseases in the country every year. 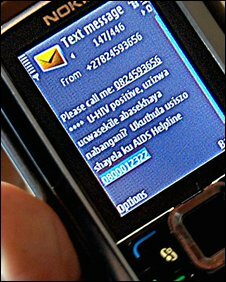 Trials of the system showed that calls to counsellors at the National Aids helpline in Johannesburg increased by 200% when messages were broadcast. "I think this is the largest ever use of mobile phones for health information," said Gustav Praekelt, one of the project's originators. The United Nations estimates that there are currently six million people living with HIV in South Africa. "South Africa is the epicentre of the global HIV epidemic," said Zinny Thabethe, an HIV activist who is part of the project. "You would think that in a country where it is so obvious that we are challenged by HIV that there would be enough knowledge to help people access care or change behaviour." However, she said, misinformation and stigma remained rife in many communities and testing levels remained low. 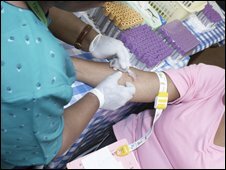 "HIV testing is widely available ...but only 5% have managed to test for HIV," she said. "Most people only get a test when they are about to die." Project Masiluleke was set up to try to counter this and encourage people to seek testing and treatment. The initiative plans to broadcast millions of health messages every month to mobile phones across South Africa. It is estimated that there are currently 43m handsets in a country of 49m people. Almost 95% of the phones are prepaid. "There is near universal coverage," said Mr Praekelt. "And in the absence of other services, the mobile phone has become the central component for people to get access to information." The system sends the messages using a so-called "Please Call Me" (PCM) service. This free form of text messaging, found across Africa, allows someone without any phone credit to send a text to a friend asking them to call. Each sent PCM message has the words "Please Call Me," the phone number of the caller, and space for an additional 120 characters. The extra space is normally filled with advertising, which helps offset the cost of running the service. About 30m PCM messages are sent every day in South Africa. "This is a great opportunity to drive social change because we can send messages to parts of the population who just never get this kind of information," said Mr Praekelt. Texts include: "Worried that you might have HIV and want to talk to a counsellor about getting tested? Call Aids helpline 0800012322." Many of the messages have been written with the help of local communities and are broadcast in English and local languages such as Zulu. Pilot projects showed that calls to the National Aids helpline rose from 1,000 to 4,000 when the system was in use. The initiative will go live on 1 December, sending one million PCM messages a day through the MTN network. Its developers hope it will encourage hundreds of thousands of people to go for an HIV test in the first year. "As South Africans we have to take a stand and we have to take responsibility to solve our crisis," said Ms Thabethe. The system will also eventually be used to provide information about tuberculosis. It has been developed and funded by a group of technology firms such as Nokia Siemens Networks, HIV charities, design firms and educational organisations such as National Geographic. It was launched at the Pop!Tech conference in Camden, Maine.